On Monday I took Ella to the dentist to have her teeth floated. 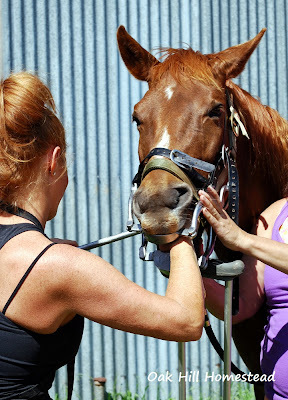 I trailered her to a friend's house, where several other people also brought their horses. Soon after Ella and I arrived the equine dentist and her assistant drove up and unloaded their gear. The examination showed that Ella did have some dental issues. She'd cut up the inside of her right cheek with the rough spots on her molars. 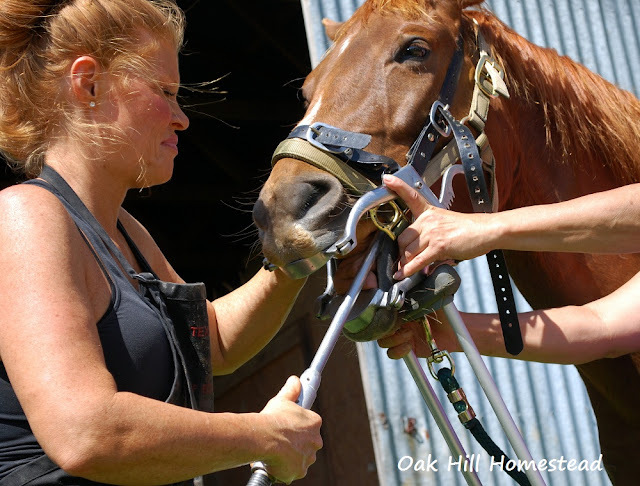 The dentist said that all horses need their teeth done regularly, whether we can see problems or not. Ella is 12 years old. Ella was given a shot to relax her, and the speculum was strapped over her head. The two metal plates were "dialed" apart so that her mouth was held open. Something I'd never seen before: they used a crutch under the horse's chin to keep them from leaning on the assistant. The horse leans on the crutch instead (or so the theory goes). Then the dentist went to work, filing teeth with several different tools, checking to feel the progress, and squirting water in Ella's mouth to rinse it out. When she was finished, she put one hand under Ella's chin, the other on top of her nose, and wiggled her upper and lower jaws back and forth to see if there were any "hang up" spots. Her teeth ground smoothly back and forth, and she was pronounced done. Just in case you're interested in the inside of a horse's mouth, here is the jawbone of a horse (something the dog dragged home). 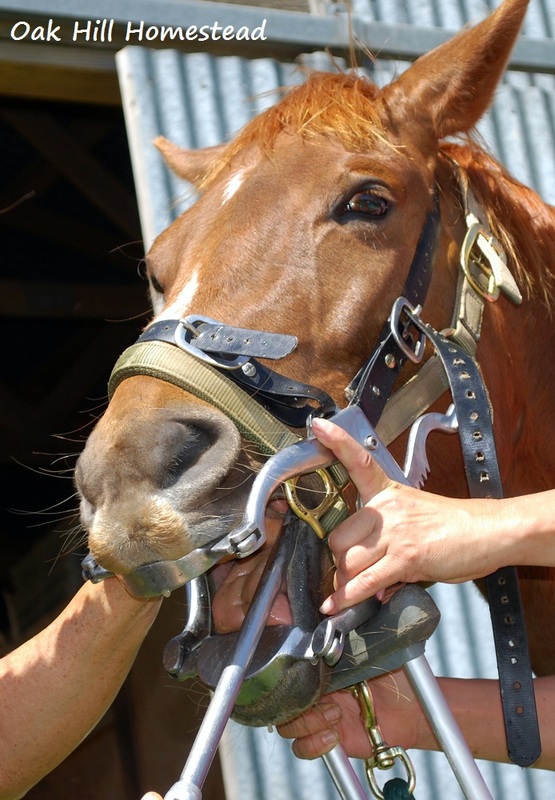 The front teeth are all that you see in a live horse's mouth, but this shows the molars further back. The top jaw is wider than the lower jaw, and rough, sharp edges can develop on the inside of the lower teeth or on the outside of the upper teeth. Ella should now be set for awhile. Hopefully she'll put on a little more weight, and she'll certainly be more comfortable when her cheek heals up. You can read more about horse's teeth here.